WASHINGTON (AP) — For just the third time in 40 years, millions of Social Security recipients, disabled veterans and federal retirees can expect no increase in benefits next year, unwelcome news for more than one-fifth of the nation’s population. “It’s a very high probability that it will be zero,” said economist Polina Vlasenko, a research fellow at the American Institute for Economic Research. Congress enacted automatic increases for Social Security beneficiaries in 1975, when inflation was high and there was a lot of pressure to regularly raise benefits. Since then, increases have averaged 4 percent a year.Only twice before, in 2010 and 2011, have there been no increases.In all, the COLA affects payments to more than 70 million Americans. Many people who get SSI also receive Social Security.Carol Mead of Montrose, Pennsylvania, said she and her husband were counting on Social Security COLA to help them with their finances. More bad news: The lack of a COLA means that older people could face higher health care costs. Most have their Medicare Part B premiums for outpatient care deducted directly from their Social Security payments, and the annual cost-of-living increase is usually enough to cover any rise in premiums. When that doesn’t happen, a long-standing federal “hold harmless” law protects the majority of beneficiaries from having their Social Security payments reduced.But that leaves about 30 percent of Medicare beneficiaries on the hook for a premium increase that otherwise would be spread among all. Those who would pay the higher premiums include 2.8 million new beneficiaries, 1.6 million whose premiums aren’t deducted from their Social Security payments and 3.1 million people with higher incomes.Their premiums could jump by about $54 a month, or 50 percent. Those with higher incomes would pay even larger amounts.States also would feel a budget impact because they pay part of the Medicare premium for about 10 million low-income beneficiaries.All beneficiaries would see their Part B annual deductible for outpatient care jump by $76, to an estimated $223. The COLA is calculated by comparing consumer prices in July, August and September each year with prices in the same three months from the previous year. If prices go up, benefits go up. If prices drop or stay flat, benefits stay the same.The numbers for July and August show that, overall, consumer prices have fallen since last year. Fuel prices are down by 23 percent from a year ago, according to the August inflation report. But prices for some other goods and services, such as health care and housing, are up. “The COLA is determined by the buying power of younger working adults,” said Mary Johnson. 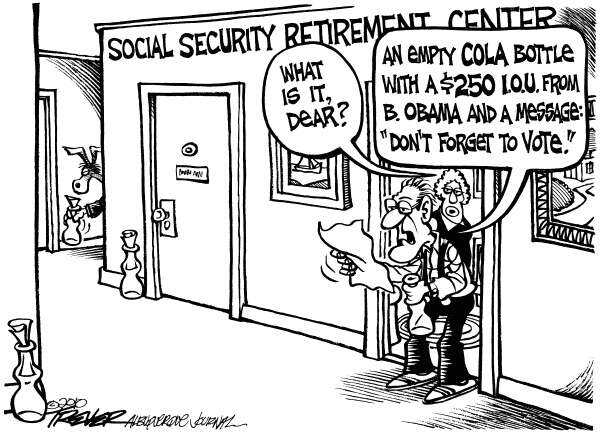 yea ask for a raise for congress take it away from the elderly what does this tell you about the goverment let the seniors out while the congress get richer what a dumb act. Part D premium went up by fully one-third.